FURTHER RESOLVED, that certified copies of this resolution shall be forwarded to Governor Andrew M. Cuomo, Senator Cecilia Tkaczyk and Assemblyman Angelo Santabarbara, the Superintendent of the State Police, and the legislature of every County in the State of New York. With my urging the Franklin County Legislators unanimously passed a resolution yesterday prohibiting the state from using the Franklin County Seal. To show a form of protest against the state’s strict gun law, Washington County lawmakers adopted a provision preventing state police from using their county seal on any paper work that deals with the SAFE Act. Washington County’s decision means they join several other upstate counties–including Warren County–who passed similar resolutions. It was a close verbal vote, Friday, in Washington County, however because the board’s votes are weighted based on population the amendment passed. Warren County supervisors don’t want county gun owners to think they had anything to do with the state’s controversial Safe Act gun laws. County supervisors followed the lead of others around upstate New York who have requested that State Police not use county letterheads or seals when sending out paperwork to handgun owners to renew their pistol permits. Handgun owners around the state will receive renewal forms in the coming months, as part of a Safe Act change requiring that permits be renewed every five years. Those forms were supposed to show some sort of county letterhead or emblem such as the county seal of the county in which the permit holder lives, but when word was received by county officials, they began voicing opposition it. The Livingston County Board of Supervisors approved a resolution Wednesday opposing the state’s use of the county seal on any correspondence related to the New York SAFE Act sent to pistol permit holders. State Police last month began mailing pistol permit recertification letters to handgun owners. The letters are sent on stationary with the seal or letterhead of the county in which the pistol permit holder resides. 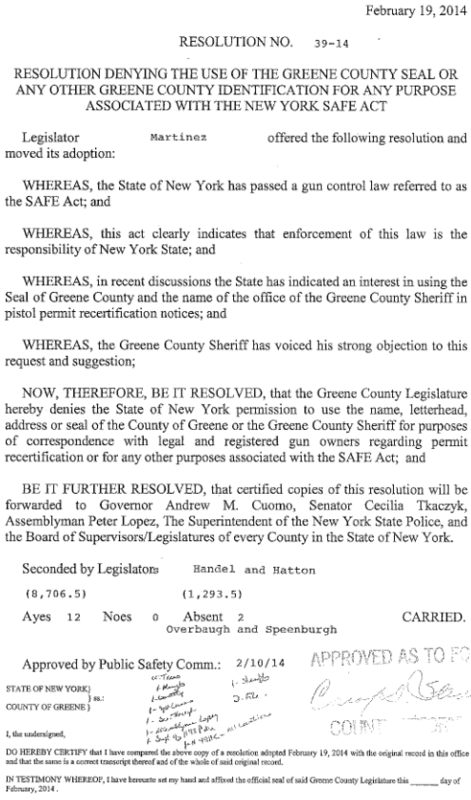 The resolution “denies the State of New York permission to use the name, letterhead, address, logo or seal of the County of Livingston, the Livingston County Sheriff and the Livingston County Clerk for purposes of correspondence with or notices to legal and registered gun owners regarding permit recertification or for any other purposes associated with the SAFE Act,” according to the resolution text. RESOLUTION OPPOSING THE USE OF THE OFFICIAL NAME, SEAL, LETTERHEAD AND AUTHORITY OF THE COUNTY OF ORANGE AND THE NAME AND LIKENESS OF COUNTY ELECTED OFFICIALS WITHOUT THE EXPRESSED WRITTEN CONSENT OF THE COUNTY OF ORANGE. WHEREAS, Orange County Local Law No. 11 of 1999, entitled “A Local Law Regulating the Use of the Official Name, Seal and Authority of the County of Orange,” prohibits the use of any official county position, or title or the use of name, seal, flag, title, letterhead, symbols, property, facilities or resources of the government of the County of Orange for any private or “non-county purpose” or in connection with any private or non-county function, . . . ,” without prior authorization. RESOLVED, that the Clerk of the Orange County Legislature is hereby directed to send certified copies of this Resolution to the Honorable Andrew M. Cuomo, Governor of the State of New York, Senate Vice President Pro Team George D. Maziarz; Senate Temporary President Dean G. Skelos, Senate Deputy Majority Leader Thomas W. Libous, Senator Gregory R. Ball, Senator John J. Bonacic, Senator William J. Larkin, Member of the Assembly Aileen M. Gunther, Member of the Assembly James Skoufis, Member of the Assembly Claudia Tenney, Member of the Assembly Frank Skartados, Speaker of the Assembly Sheldon Silver, Assembly Majority Leader Joseph D. Morelle, Assembly Minority Leader Brian M. Kolb, and all others deemed necessary and proper.